We’re already fans of reusable BOBO gift wrapping scarves, but their new Baby Wrap Mini takes the cake in the cuteness category. 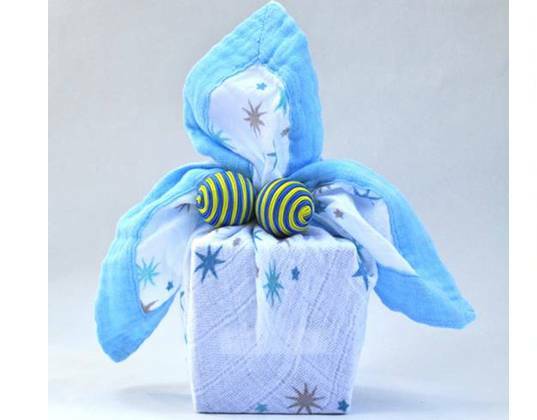 This new mini BOBO allows you to nicely wrap up a tiny baby gift for parents-to-be. Plus, after parents unwrap the gift, the BOBO becomes a comfy little security blanket for the new baby. Available in Blue Stars or Pink Butterflies. We're already fans of reusable BOBO gift wrapping scarves, but their new Baby Wrap Mini takes the cake in the cuteness category. This new mini BOBO allows you to nicely wrap up a tiny baby gift for parents-to-be. Plus, after parents unwrap the gift, the BOBO becomes a comfy little security blanket for the new baby. Available in Blue Stars or Pink Butterflies.